It's a fair question for any of us: How does stress affect the body? The answer: Multiple ways, ranging from chronic headaches to joint pain to psoriasis. Our author has advice to help you avoid "sweating the small stuff." How does stress affect the body? In a number of ways, ranging from chronic headaches to joint pain to psoriasis. Our author has advice to help you avoid "sweating the small stuff." Have you ever been on your way home from work and found yourself stuck in the worst traffic imaginable? Does your kitchen sink seem to continuously find new ways to leak, no matter how many times you try to fix it? Do you get completely agitated when you can’t, for the life of you, find the rosemary in the spice cabinet? These sorts of daily, common problems affect all of us, and they are hard (if not impossible) to avoid. But how does stress affect the body, and what can we do about it? Stress can come in many forms. Stressful life events include things like divorce, death of a loved one, or losing your job. Chronic stress involves ongoing problems such as living in poverty, a troubled marriage, or working a difficult job. Daily hassles are minor in comparison, and consist of things like family arguments, lost keys, or household repairs. 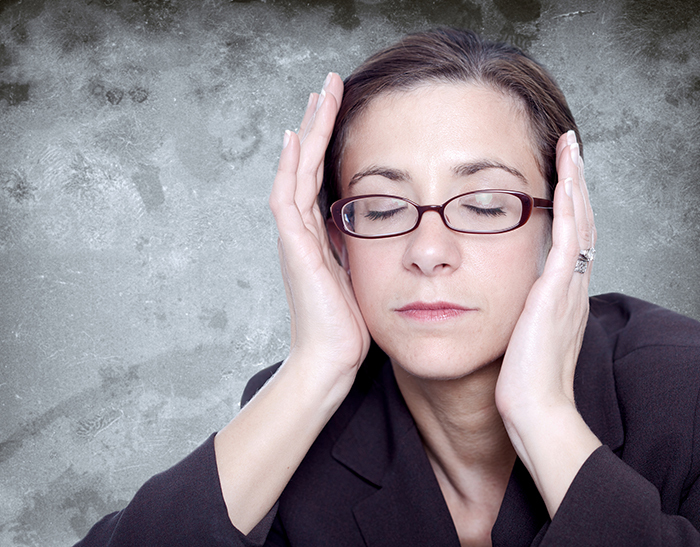 Numerous studies have examined the effect of chronic stress on health. Not surprisingly, chronic stress is associated with an increased risk of cardiovascular disease, chronic health issues, and mortality. But do daily stressors, which seem so minor in comparison, have the same effects? Although daily stressors are indeed less severe than chronic stressors or stressful life events, they are still associated with the same negative effects on physical health. In fact, people report fewer physical symptoms and higher levels of overall health on stressor-free days compared to days in which daily hassles are experienced. Daily stressors also exacerbate symptoms of chronic health conditions, such as joint pain, psoriasis, and chronic tension headaches. A study in the journal Experimental Gerontology, following 1,293 men over many years, found that both stressful life events and daily hassles increased the risk for mortality, independently of each other. Another study found that it wasn’t necessarily the amount of daily stressors people experience that increase their risk of long-term health problems; instead, it was the way people negatively reacted to daily stressors that was strongly associated with chronic health conditions later in life. The results suggest that it isn’t how much we are exposed to daily hassles and problems that puts us at risk, but more how we react and deal with them. How Does Stress Affect the Body on a Daily Basis? Luckily, there are many ways to reduce stress and improve your ability to cope with daily problems. Meditation, yoga, or other mindfulness-based techniques are great ways to keep your mind calm. Research also suggests that biofeedback training can be extremely effective in reducing daily stress levels and physiological markers of stress like cortisol levels. How does stress affect the body when it comes to minor daily issues? Do you find yourself getting worked up? What do you do to deal with daily hassles better? Share your tips in the Comments section below. Ann Behav Med. 2013 Feb;45(1):110-20.
brain, cardiovascular, cardiovascular disease, chronic stress, chronic tension headaches, cortisol, daily hassles, headaches, health, health problems, how does stress affect the body, joint pain, meditation, mindfulness, mortality, pain, psoriasis, report, stress, tension headaches, ways to reduce stress. I have found that having a regular exercise routine helps me better manage small stressors (and big ones too!) Getting outside in fresh air and sunlight helps too. I couldn’t agree more. Taking even a short walk helps me a lot – especially on a nice day when the sun is out.